Courage is a quality of mind and spirit. Courage is not the absence of fear, but of being afraid and doing it anyway. It is walking straight into fear with a deep sense of knowing that you’ve got this and everything will be okay. Courage gives us the ability to discover something about ourselves we didn’t know we had and propels us forward. Courage asks us to step in to the best versions of ourselves to create a kinder, more compassionate and loving world…one person at a time, one moment at a time. This month we’re reading the novel All the Light We Cannot See by Anthony Doerr. It is a deeply moving book about a blind French girl and a German boy whose paths collide in occupied France as they both try to survive the devastation of World War II. 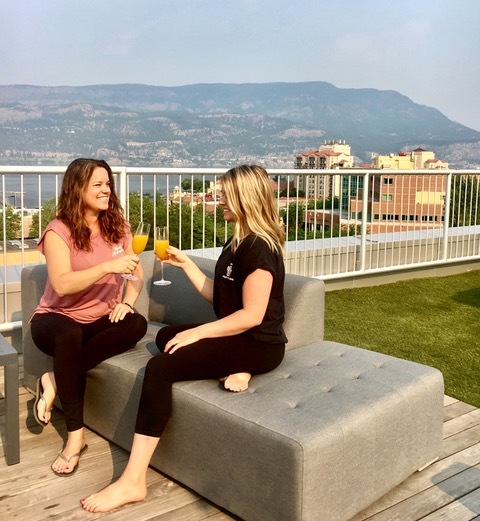 August’s special event is Rooftop Yoga & Brunch. Grab a friend and join us for a 75- minute fun and uplifting yoga class followed by brunch with bottomless mimosas at Gather. Gather is a brand-new restaurant on the ground floor of the Innovation Centre – we’re super excited to check out their space. All proceeds from ticket sales will be donated to the Central Okanagan Food Bank in support of families affected by the wildfires. Tickets are $50. Spots are limited, buy now on MindBody or in the studio.